Popular holster to fit all pruners. Has extra riveting last longer. The original FELCO design. Solid-forged metal alloy handles are complemented by a Swiss precision made hardened cutting blade (replaceable) and an anvil blade with a sap groove. A hardened bolt and nut assure exact adjustment of both the cutting and anvil blades. A rubber cushion and shock absorber provide smooth working and soft closing. Length 8 1/2", weight 8.5 oz. Designed for those with smaller hands who may prefer a smaller, lighter pruner. 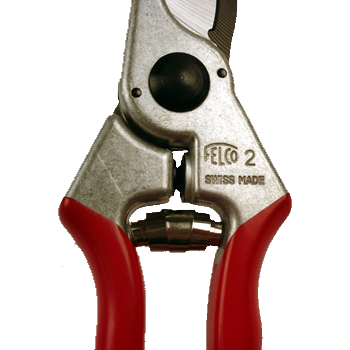 Comfortable to use, yet as sturdy and powerful as the other FELCO models. The shorter blades are ideal for small pruning work such as grapevines, shrubs and young trees, also floral uses. The cutting and anvil blades are not riveted. Length 7 1/4", weight 7.5 oz. Patented blade design. The shape of the blade is thinner at the top and thicker at the bottom where the teeth are. This unique feature keeps only the teeth in contact with the material to be cut, preventing clogging and binding. Cuts branches up to 4" in diameter. Overall length 14", blade length 6", weight 4.9 oz.